The Jackson AJ-44 conveyor dishwasher has a center-mounted, stainless steel pawl bar that hold the racks of dishes. This pawl bar does not interfere with the spray patterns in any section, allowing your dishes to be fully cleaned. You can control the number of racks that can be cleaned each hour with the Adjust-A-Peak™ feature by restricting how fast the conveyor runs. The operator can slow the machine down to 124 racks per hour to clean heavily soiled wares. The machine can be sped up to 234 or 248 racks per hour, depending on whether it is set up for chemical or high-temp sanitizing. Each kitchen has a different setup, so this dishmachine can be converted from right-to-left to left-to-right in the field. The incoming water pressure regulator controls how fast and pressurized water comes into the machine. Electromechanical controls are used instead of solid state to help make the machine reliable. EnergyGuard™ controls power on the wash and rinse sections of the machine only when a rack is present to help save energy. With a 25-inch clearance throughout the entire machine, you can easily wash trays, bun pans, 60-quart mixing bowls, and more. The front appearance panel hides the wash tank and interior components to help keep them from becoming damaged. The 8-inch vent cowls and splash shields on both ends of the unit prevent water from getting all over your floor. The 2-inch-diameter, stainless steel tubing makes up the dishmachine's frame and is formed and saddle-welded for strength. Your dishes are cleaned in the wash cycle by using make-up water from the last rinse cycle that has detergent mixed in. Upper and lower wash arms spray the water onto each rack of dishes; the arms easily remove for cleaning. As racks come through the machine, the wash cycle starts automatically. Stainless steel strainer pans collect the food scraps to prevent them from getting all over your dishes in the next cycle. The minimum temperature of the wash cycle is 160 degrees Fahrenheit. An 18-inch separation between the wash and rinse sections provides you with excellent cleaning results. Rinse arms in are mounted above and below wares, ensuring your dishes are fully cleaned. The arms come with fan jet nozzles. If you decide to sanitize your dishes with high-temperature water, you can produce up to 248 racks per hour and use 0.94 of a gallon every rack. By using chemical sanitation, you can clean 234 racks per hour and use 1 gallon of water for each rack. 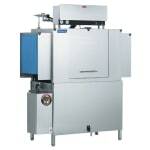 The Jackson AJ-44 conveyor dishwasher is available in 208, 230, and 460 voltage options. You must choose one of these options when you place your order, and you must also specify whether your machine will be installed on a 1 or 3 phase power supply. As previously mentioned, you can decide if you want to use high-temperature water or chemicals to sanitize your dishes in the final rinse cycle. Phase and Voltage: You must choose whether your machine will connect to a 208, 230, or 460 volt electrical connection. You may also need to choose whether it will connect to a 1- or 3-phase power source. Make this choice based on the electrical supply available in your building. Sanitization Method: You must specify whether your machine will sanitize dishes via high-temperature water or with lower-temperature water and a chemical sanitizer. Learn how to choose between the two here. Steam or Electric Heat: You must choose whether your machine will include electric heating elements or connections for steam heat. If your facility has access to steam heat from a central boiler, the latter may be the most cost effective method. 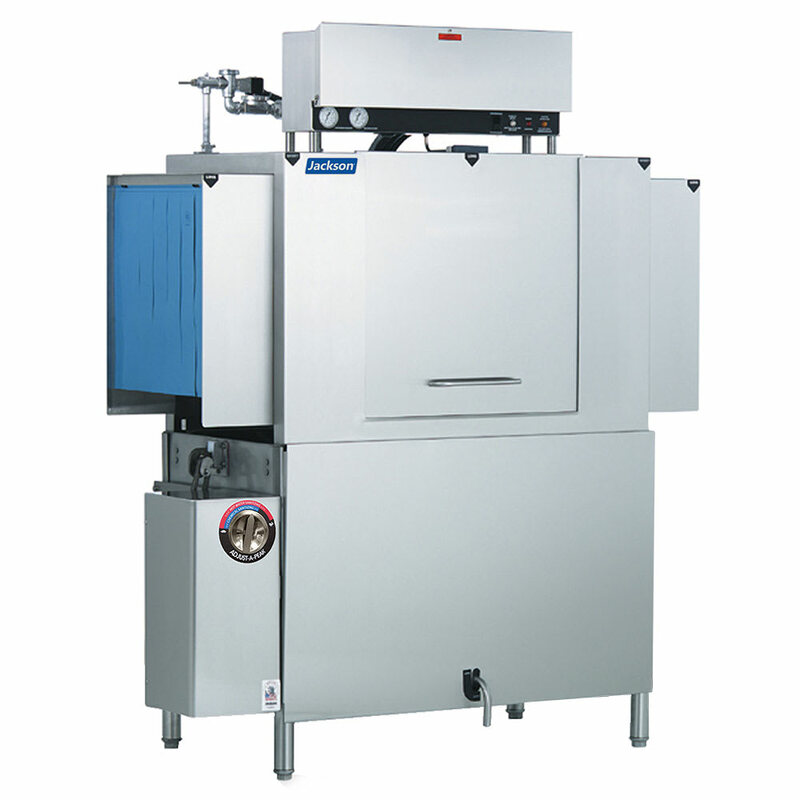 Booster Heater Temperature Rise: If you opt to purchase a high-temperature sanitizing dishmachine, you must select whether you need the booster heater to provide a 40- or a 70-degree-Fahrenheit rise. Table Limit Switch: You can order this machine with a table limit switch that connects to a receiving dish table and shuts the machine down when that table becomes full. Side Loader: This dishmachine can be ordered with a sideloader that allows the machine to accept dishracks at a 90 degree angle, allowing the equipment to be installed in a corner. Exhaust Vent Fan Control: An exhaust vent fan control is available that will turn the exhaust vent van on automatically when a rack enters the machine. Flanged Feet: Available flanged feet can be used to bolt the machine to the floor for secure installation. Water Hammer Arrestor: A water hammer arrestor will protect the machine's components from surges in water pressure when water supply valves open.